Nellie B. (Scaletti) DeFillippo, age 97, of Lawrence, passed away peacefully at Mary Immaculate Nursing & Restorative Center, surrounded by her loving family on October 28, 2018. Nellie was the beloved wife of the late Angelo J. DeFillippo, a veteran of the Normandy invasion in WWII. She was the eldest of five daughters of the late Carmine and Cecelia (Calenzo) Scaletti of Lawrence and was born in Rongolisi di Sessa Aurunca, Italy. Hers was a truly American immigrant story. Her father, Carmine, arrived in the US one year earlier and earned the money needed to send for his wife and infant daughter and their passage through Ellis Island in 1922. She was educated in Lawrence Public Schools and was a graduate of Lawrence High School, Class of 1940. As a young woman, Nellie was employed for many years in Lawrence retail shops, Woolworth’s and Sutherland’s department stores. 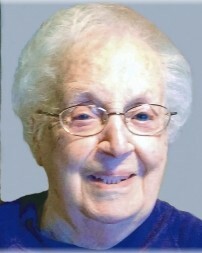 After dedicating much of her married life to raising her five children, Nellie earned a certificate in early childhood education from Greater Lawrence Technical School and immensely enjoyed a lengthy and fulfilling career as a teacher’s aide in Lawrence Public Schools. Nellie was happiest when she was planting and caring for a vegetable garden in her yard or when she was preparing and serving her Italian specialties during the holidays with her entire family crowded around the table. She was predeceased by her husband, Angelo, in 1982. Nellie will be greatly missed by her five children, sons, David and wife, Kathleen (Begley), Andrew and wife, Xuelan, all of Lawrence, Carmen and wife, Susan (Belanger) of Townsend, MA, Louis of Santa Rosa, CA, and daughter, Carol and husband, Robert Granara of Londonderry, NH. Nellie is also survived by her beloved sisters, Gloria Vellette of Methuen, Ida Hale of Avon, MA and Domenica “Minnie” Gabriel of Burke, VA. She was predeceased by her sister, Lena Saad of Lawrence. Nellie will always live in the hearts of her ten grandchildren: Kerry Ann, Daniel, Matthew, James, Guosen, Amy, Joseph, Derek, Colleen, and Michael; as well as her six great-grandchildren: Anthony, Sophia, John, Giuliana, Luca and Ella. Nellie is also survived by many beloved nieces and nephews. The DeFillippo family extends its deepest appreciation to the dedicated staff of Floor 3A at Mary Immaculate Nursing & Restorative Center for their expert and compassionate care provided to Nellie. At the request of the family, visitation will be private. A funeral mass will be held on Friday, November 2, 2018 at 10:30 AM at St. Michael Church, 196 Main Street in North Andover, MA. In lieu of flowers, memorial donations may be made to Mary Immaculate Nursing & Restorative Center, 172 Lawrence Street, Lawrence, MA 01841.